When it comes to wedding stationery, we give you choices, choices and more choices. We know you're looking for wedding stationery that perfectly matches the style, mood and tone you wish to create for your nuptials. 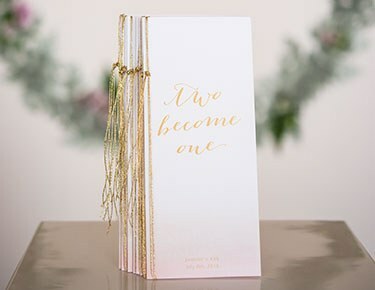 Our wonderful collection makes it easy for you to create eye-catching programs, hand fans, posters and signs.Wedding ProgramsCreating a beautiful wedding program starts with selecting one of our elegant personalized wedding program designs. These designs typically feature vintage or contemporary fonts, ornate or modern graphic images and subtle color shades. Simply scroll through our collection and find ones you like. The next step is deciding how well each design fits with your wedding theme.After choosing the best design for you, select your color and customization preferences. Each program design offers its own personalization options, and that may include room for names and up to several lines of text. Choose single-fold one-sided print or tri-fold one-sided print.To speed things up while ordering, prepare your custom text ahead of time. Once you receive your lovely programs, you can send them off to the printer anytime for completion.Hand FansWhether the ceremony takes place indoors or outdoors, help your guests remain cool with personalized hand fans. Printed on both sides, our fans are made of durable heavy-duty stock paper, and they're die-cut into aesthetically pleasing shapes. Curvaceous wooden handles are designed for comfort. Styles range from classic to modern, and with customization, they become a treasured keepsake.Wedding Posters and SignsDirect wedding attendees to where all the action is taking place with customized posters and signs. Depending on the venue, you may need one or more signs pointing the way for guests. Directional posters are ideal for indoor locations, and they're made of heavy-duty stock paper to ensure they stay put. 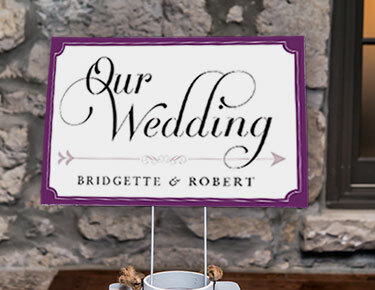 We've already created the design, so all you need to do is add a touch of personalization.Our bold outdoor signs are just the thing you need to ensure guests know they've found the right venue for your wedding and reception. Decorative hanging signs have room for witty words of wisdom, couple names or anything else you want to say.